JULY '98 ISSUE OF SCIENTIFIC AMERICA " MAN'S PATHFINDER MISSION "
"A recent great confirmation to what has been revealed concerning Mars' atmosphere and its size was unwittingly presented by an article that appeared in the July 1998 issue of Scientific American. The title is "Mars Pathfinder Mission" A computer enhanced photo showed a sunset on the terrain. The sky was red and the light from the sun was far more diffused that it would be on Earth. Since Mars is much larger than the Earth, the horizon is much further away. This means the light must pass through a lot more atmosphere. This coupled with the fact Mars has more than three times as much atmosphere per unit area than Earth compounds the situation. It looked as if the sun were peeking through a cloud formation. Sunset was the "ideal" time to take the photo since the other part of the binary had already dipped below the horizon." "Another computer enhanced photo showed blue clouds in the sky. It was stated that of all the water in the clouds condensed as rain it would produce a layer of water less than 1/100 of a millimeter thick. This demonstrates the kind of intelligence prevalent among our venerated scientists. How could such an infinitesimal amount of water produce a cloud, let alone ones a prominent as those shown in the photo." "According to NASA, recent calculations have shown that the Martian atmosphere has only about 1% of the density of the Earth's. This contradicts other finding concerning cloud formations. Dense and very extensive clouds clouds are often detected on Mars. Pictures of the volvano Olympus Mons have shown clouds hovering close to the summit of the moutain, which is supposed to rise 15 miles (13.6) above the surrounding countryside. It is claimed that coulds are often found at an elevation of 90,000 feet! This is much higher than any water vapor and ice clouds found on Earth. The fact that they move shows that the air is sufficiently dense ar such altitudes to produce winds capable of moving clouds. This indicates that Mars truly has an atmosphere denser than that of the Earth at such elevations." Olympus Mons Cloud Cover Fifteen Miles High! Mars has some enormous volcanos, the largest of which is Olympus Mons, a volcano that towers high on the Tharsis Plains. Estimates of its elevation range from 15 km to 27 km, and it has been photographed extensively since Mariner 9. Curiously enough, it is the only feature on Mars for which a true color photograph has been released. 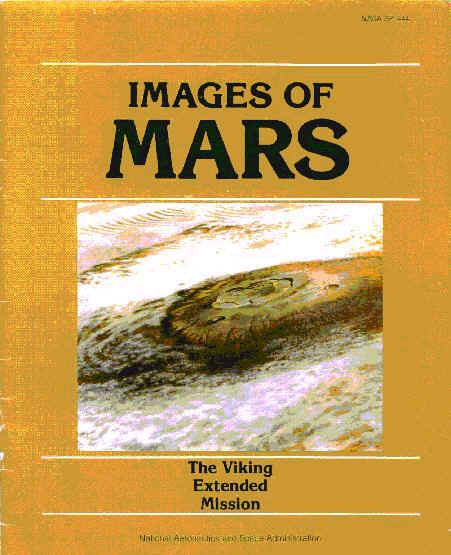 In March 1980, the space agency published a photographic text entitled Images of Mars - The Viking Extended Mission, NASA SP-444. 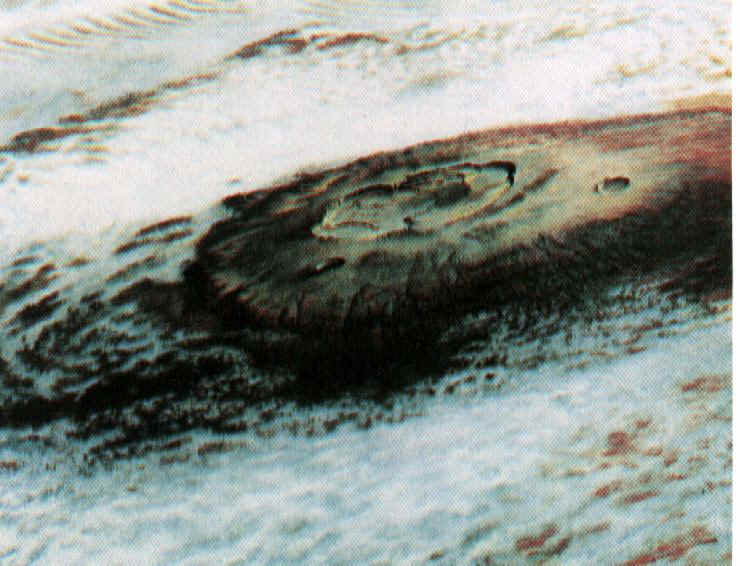 This color photograph of Olympus Mons is on the front cover of the publication, yet there is no mention of this detailed picture inside the text. This remarkable photograph is reproduced on Plate 11. The detail is clear and sharp. Extensive cloud cover can be seen surrounding the high summit that shows natural earth colors, and there is a subtle hint of foliage. The thick clouds at such a high elevation are the knockout though. They prove that the Martian atmosphere must have a density and pressure at the surface much higher than we have been told. It is probably on the order of 100 times as dense. This estimate would make it 700 to 800 mb on Mars, compared to 1000 mb at sea level on Earth. 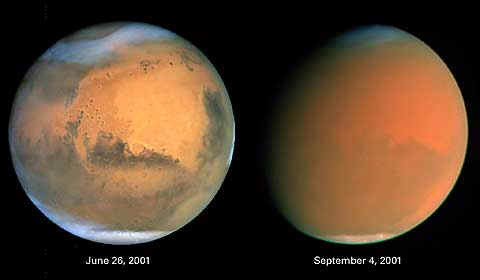 Joseph H. Cater on the Martian atmosphere: "Mars undoubtedly has a relatively thin shell like the Moon since it does not seem to have large openings into the hollow interior. The resulting high negative ion content would prevent gravity from compressing the atmosphere to the extent the Earth does its atmosphere. Consequently, air density would not drop off with increase in elevation as rapidly it does on the Earth. As a result, ideal temperatures and atmospheric densities would exist at extreme elevations, as is shown on Olympus Mons at about 75,000 feet." The above comments are from Joseph H. Cater, in his book The Awesome Life Force, Page 192. "The Viking 1 lander was released from the main orbiter, and went down to a landing on the Chryse Plain on July 20, 1976. A parachute was used to brake the 1,200 pound lander as it plunged to the surface. We can understand a parachute working in the Earth's atmosphere of several hundred millibars pressure. But since NASA stated that the surface pressure on Mars is only 7 millibars, and less than a millibar a few miles up, what inflated the parachute and caused any kind of drag to slow down the descending lander? The answer is simple: the same dense atmosphere that was photographed during the telescopic studies, and the same one that the NASA censors deny is there." "We were given indirect evidence of a notable atmosphere, with the first color photograph that was transmitted back from the surface on July 21, 1976. Not many people know that it showed a beautiful blue sky. The San Diego Union newspaper printed the photograph in full color on the front page of the July 22 edition, with an accompanying article titled "Planet Boasts Blue Sky." The picture was more than aesthetic. It looked just like the sky on earth, and strongly hinted that the Martian atmospheric constituency diffused sunlight the same as our earthly sky."